Today is one of those rare days when space decides to just own the news. Tonight’s also the third and final presidential debate, a series that’s downright miserable. With so much legitimately grand space news happening today, it’s the perfect opportunity for either Hillary Clinton or Donald Trump to talk about it. They probably won’t, but it wouldn’t be for a lack of material. Three astronauts launched to the International Space Station aboard a Soyuz rocket launched from Kazakhstan. The ExoMars mission, being conducted by Russia’s Roscosmos and the European Space Agency, finally reached Mars this week. Meanwhile, on Earth, the American Astronomical Society is holding its annual conference in Pasadena, California, to discuss the latest, and biggest news in space science. Later this afternoon, NASA will provide an update on its Juno mission, investigating the mysteries behind the solar system’s biggest planet, (and address questions about the future of the spacecraft). Space policy is international policy. A space cooperation is one of the few things keeping the United States and Russia from outright giving one another the silent treatment — although that’s quickly dissolving anyway. A Trump presidency would most likely advocate for drastic cuts to NASA in favor of letting private industries take over space travel and operations (a plan with its own array of drawbacks). Space mining could be a boon for smaller countries looking to become legitimate space powers, and for the growth of the commercial space industry — or it could simply accelerate what already seems to be the inevitable slide towards a militarized orbit around Earth. Surely Clinton and Trump have differing views on space policy. If only there were an event where both could be in the same room to share their ideas and argue over them in order to give people a better sense of their positions. But what happens if the United States stumbles on the way? Simply put, it opens the way for ESA, Russia, and China to strike for Mars. Schiaparelli’s landing will be a milestone in helping Russia and ESA learn how to land spacecraft on the Red Planet. After that, the ExoMars rover, to land in 2020, would solidify both agencies’ position as legitimate explorers of Mars, paving the way for future missions that could perhaps, in a couple of decades, include humans. And let’s not forget China is planning to land its own rover on Mars by 2020. The country’s space program has typically lurked in the shadows of better programs like NASA and Russia’s efforts, but the last few years — culminating in the launch of a second space station into orbit and two taikonauts to live and work aboard the spacecraft during a month-long mission. In short, the biggest country in the world is making extremely rapid progress. It’s not too difficult to imagine they will one day master the science and engineering behind sending humans to Mars, as well. Which brings us to Clinton and Trump’s debate. Getting to Mars first isn’t simply a feat in innovation and exploration for the country. The entire world sees a permanent presence on Mars, not as an abstract dream, but as a tangible, inevitable reality. And perhaps more critically, the journey to Mars also includes the expansion of humans into cis-lunar space (the region between Earth and the moon), and beyond Mars itself. 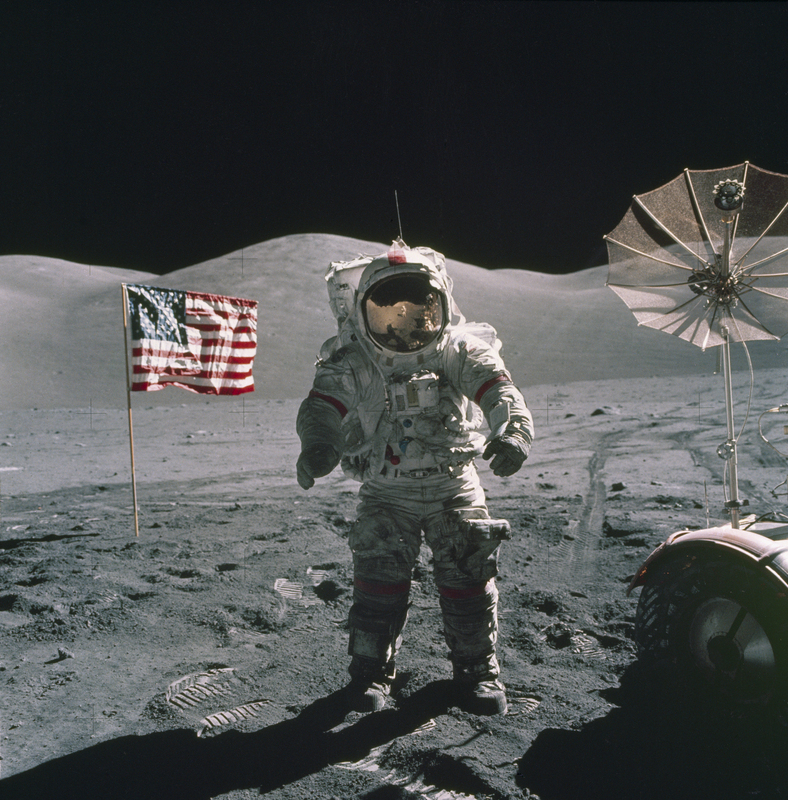 Apollo 17 Mission Commander Eugene A. Cernan remarked that the astronauts were leaving as they came, "with peace and hope for all mankind," after this mission in December 1972. It’s in the longterm interest of the United States to make concrete plans for how it intends to pioneer these endeavors before other countries. Unlike the missions to the moon in the late ‘60s and early ‘70s, we’re not simply going there and coming back. When we get to Mars, we’re staying. For the United States to establish a footprint first, would ensure American policy is the basis for space travel for perhaps a century or more. That’s why Clinton and Trump need to talk about Mars tonight. A discussion of Mars would underscore the point that policies are meant to not just help out people in the current moment, but lay the foundation for success and prosperity for future generations. It’s been repeatedly said that the new generation, growing up now, are the Mars Generation or Space Generation, for which space travel and exploration is not an abstract dream, but a realistic goal. For millennials, a discussion about space does not come across as fantasy, but prescient of the future, and respectful of our interests. And those interests include, making sure the President of the United States takes seriously, the plan for America to get to Mars. Let’s hope the two candidates make an least a small effort to talk about what they have in mind for space policy during Wednesday evening’s debate. They probably won’t — science and space is often shoved to the back in favor of more Earthly topics — but now is a remarkably good time to bring up the topic.